Ministers of Service: Though all are servants by Baptism, the permanent deacon is ordained as a sacramental sigh of Christ the Servant. Deacons offer direct service to those in need, and also help church members to discover their participation in the ministry of Christ. Service is the calling of the deacon. Ministers of the Church: Permanent deacons are ordained for the service of the diocese and are recognized as collaborative associates of the Bishop and priests, lay ministers and professionals. The ministry of permanent deacons in parishes, and in special outreach ministries, calls for a team approach complimentary to the ministries of others. Ordained Ministers: Permanent deacons share in the Sacrament of Orders with the Bishop and priests. 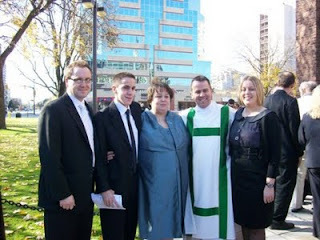 By ordination the permanent deacon is brought into a new relationship in Christ through the Holy Spirit. Graced for ministry, the permanent deacon is publicly acknowledged by the Church as one called by God to serve the community of believers and the evangelizing mission of the church. What They Do: A permanent deacon's ministry evolves in response to specific needs and his God-given talents. There are three dimensions of diaconal service: Ministry of Love and Justice, Ministry of the Word of God, and Ministry within the Liturgy. Permanent deacons prepare the faithful to receive the sacraments and to carry out their vocations as baptized Christians. They are able to preach, teach, counsel and give spiritual guidance. They baptize, witness marriages, and preside at wake services. In all they do, permanent deacons act as servants of the church.